Multicam Combat Clothing for serious professionals! 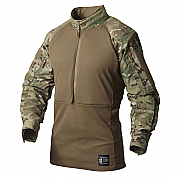 Our range of Multicam Combat Clothing has been chosen for its value and reliability. All these Multicam products are produced using Genuine Crye Precision Multicam, under trade agreements with each brand. Please note: Only the Potomac Advanced Combat Shirt (ADCS) is fire-retardant. The Potomac Advanced Combat Shirt Gen. II is the most efficient piece of combat clothing on the market today. It’s a Multicam T-shirt with long, camouflaged sleeves and multi-function spacer material on your body. The ADCS/UBACS torso part is made of the thinnest fabric in our range, whereas the Multicam fabric used for the sleeves is slightly stronger. The Multicam combat shirt is the perfect choice if you need to transport heat and sweat away from your body and also want the best protection against explosions and the environment in which you fight.